For other uses, see Fatima (disambiguation). Fátima (Portuguese pronunciation: [ˈfatimɐ] ( listen)) is a city in the municipality of Ourém, Beira Litoral Province, in the Central Region and Middle Tagus Subregion of Portugal, with 71.29 km² of area and 11 788 inhabitants (2011). Its population density is 162,7 hab/km². 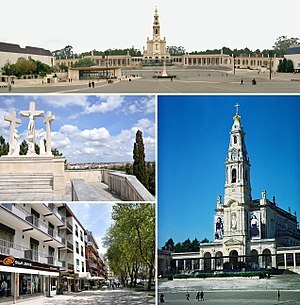 The homonymous civil parish encompasses several villages and localities of which the city of Fátima, with a population of 7,756 residents, is the largest. The worldwide fame of the city is permanently associated with the apparitions of the Virgin Mary reported by three little shepherds – Lúcia, Francisco and Jacinta – from May 13 until October 13 of 1917. The Catholic Church later recognized these events as "worthy of belief". 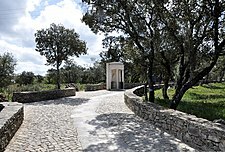 A small chapel, now known as the Chapel of the Apparitions, was built at the site of the supernatural events, and a precious statue of Our Lady of Fátima installed. Due to the Sanctuary of Our Lady of Fátima, a Marian shrine complex containing two minor basilicas, located in the wealthy quarter of Cova da Iria, the city has become in one of the most important international destinations of religious tourism, receiving between 6 and 8 million pilgrims by year. It attracts the religious people, but also those who seek a peace lifestyle usually only found in the convents and monasteries. A close-up of the Christian pilgrims during the Miracle of the Sun on 13 October 1917. An image of the crowd during the last apparition in Cova da Iria. 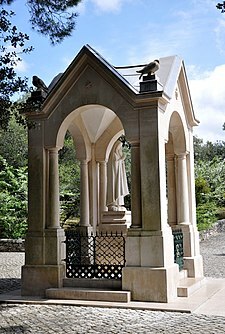 Monument of the Guardian Angel of Portugal apparition to the three little shepherd children of Fátima. Statue dedicated to the apparition of Our Lady which occurred exceptionally in Valinhos, near the Cova da Iria. Fátima was said to be the name of a Moorish princess kidnapped by a knight, Gonçalo Hermigues, and his companions. Hermigues took her to a small village in the Serra de Aire hills, in the recently created Kingdom of Portugal. 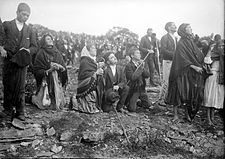 According to the Western Catholic narrative, Fatima fell in love with her kidnapper and decided to convert to Christianity in order to marry him. She was baptized and given a Christian name, Oureana. Arab sources, however, claim that Fátima was forced into Christianity, as were most Reconquista captives. There is no documentary evidence to support either scenario of such a conversion. Whatever version is true, the place name recalls the Princess' original Arab name rather than her Christian baptismal one. 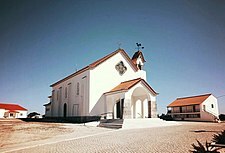 The parish was founded in 1568, when it was annexed by the Collegiate of Ourém (Portuguese: Colegiada de Ourém). For centuries, most of the villagers kept herds of sheep and depended also on subsistence farming. Since the early 20th century, Fátima has been associated with events in which three local children, Lúcia dos Santos and her cousins, Francisco and Jacinta Marto, purportedly saw visions of a woman known as Our Lady of Fátima, since believed by the Catholic Church to be the Virgin Mary. On 13 May 1917, whilst guarding their families' sheep in the Cova da Iria, the children first claimed to have seen an apparition of a "lady dressed in white" and shining with a bright light. 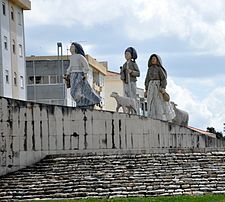 The three shepherd children were born in Aljustrel, a small hamlet about 1 kilometre (0.62 mi) from Fátima. To the west, near Aljustrel, is Loca do Cabeço, a smaller agglomeration of rocky outcroppings where, in 1916, an angel appeared twice to the three children. The children claimed to have seen the Marian apparition on six occasions; they said the last would be 13 October 1917. An estimated 70,000 pilgrims went to the site for the last prophesied apparition in October. Some of them reported what has been referred to as the Miracle of the Sun, when some observers reported it appeared to be behaving unusually. The local bishop investigated the events and determined that the apparitions were worthy of belief. The site was marked by a cross erected by locals. In 1918 they built a small chapel, built from rock and limestone and covered in tile. It was 3.3 metres (11 ft) by 2.8 metres (9.2 ft) length, and 2.85 metres (9.4 ft) height. It became a centre for Marian devotion, receiving names such as a fé de Fátima, cidade da Paz ("the faith of Fátima, City of Peace"), or Terra de Milagres e Aparições ("Land of Miracles and Apparitions"). The chapel has since been enclosed within a large basilica and sanctuary, part of a complex including a hotel and other facilities. In 1930, the statue of Our Lady in the Chapel of Apparitions was crowned by the Vatican. Francisco died in 1919 and Jacinta in 1920, during the international Spanish flu pandemic. Lucia dos Santos became a nun and lived until 2005. The two who died young were beatified on 13 May 2000 by Pope John Paul II, and were canonised by Pope Francis on 13 May 2017, the hundredth anniversary of the first apparition. The construction of the sanctuary and the steady visits by pilgrims stimulated local development. In addition to construction of a large shrine, basilica, and sanctuary, the complex includes a hotel and other facilities. The town of Fátima was elevated to the status of city on 12 July 1997. In the early 21st century, numerous residents of the parish (primarily from its business sector) worked to have Fátima designated as an independent municipality. The project, led by Júlio Silva, engineer and ex-president of the Junta de Freguesia (Parish Council), was vetoed on July 2003 by President of Portugal Jorge Sampaio. Fátima is located on the Estremenho Limestone Massif, on the flanks of the Serra de Aire, approximately 350 metres (1,150 ft) above sea level. The geology of the Serras de Aire and Candeeiros gives rise to an arid landscape with a rocky ground interspersed with limestone outcroppings. There are various geological formations in the region including sinkholes, uvalas and polje (like the Polje de Minde-Mata), as well as karst grottoes, caves with stalactites and stalagmites, in addition to lapiez fields. The climate is characterized by heavy precipitation during the winter, with approximately 900 millimetres (35 in) annually, and warm, dry summers. The trees in this area are primarily dominated by holly oak (Quercus ilex), Portuguese oak (Quercus faginea), strawberry trees (Arbutus unedo), buckthorn and olive trees, all of which are resistant to the precipitation extremes of the climate. There are also areas of savannah, strips of land bounded by walls of loose stone. 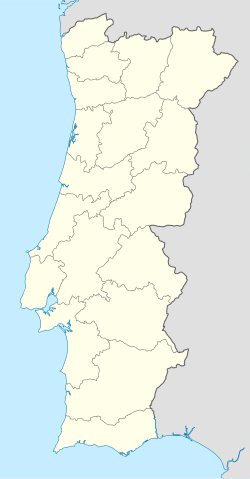 The parish contains the following localities: Aljustrel, Alvaijar, Amoreira, Boleiros, Casa Velha, Casal Farto, Chã, Charneca, Cova da Iria, Eira da Pedra, Fátima, Giesteira, Lombo da Égua, Maxeira, Moimento, Moita Redonda, Moitas, Montelo, Pederneira, Poço de Soudo, Ramila, Vale de Cavalos and Valinho de Fátima. The devotion through Our Lady of Fátima attracts millions of Christian pilgrims to Fátima, in Portugal. The economy of the town relies on religious tourism because the world devotion through Our Lady of Fátima attracts millions of Christian pilgrims. The locals have numerous shops and stalls devoted to the sale of religious articles and souvenirs. In addition, services for tourists, hotels, restaurants and other retail also benefit from the visitors. Other economic activities in the region include: marble sculpturing, saw-milling, carpentry, civil construction, commerce, and services. The bus station of Fátima. The Basilica of the Holy Trinity is the 4th largest Catholic church in the world. The Way of the Cross in Valinhos. The Calvary in Fátima, Portugal. Basilica of the Holy Trinity (Portuguese: Basílica da Santíssima Trindade), on the far side of the sanctuary's esplanade is the basilica, a neo-classical structure with a central tower 65 meters (213 ft) high, which was begun on 13 May 1928. It is flanked by colonnades linking it with the extensive convent and hospital buildings. Within the basilica are the tombs of the three witnesses to the apparitions: Jacinta and Francisco Marto and Lúcia dos Santos. The Church of the Holy Trinity, one of the largest churches in the world, was built on the other side of the esplanade in the early 21st century. 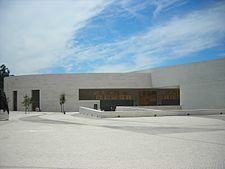 The Sanctuary of Our Lady of Fátima, in Cova da Iria, is the principal focus of all visitors. Annually, at least five million Catholic pilgrims fill the country roads leading to the Marian shrine. 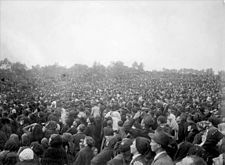 Numbers can reach hundreds of the thousands on 13 May and 13 October, the most significant dates of the apparitions in Fátima. Fátima's major sports club is the Sport Center of Fátima, currently in Portuguese football's second tier, the LigaPro. ^ "How Fatima Came To Be". www.holymary.info. ^ "القديسـة فـاطمـة Saint Fatima". www.iraker.dk. ^ "Pope Francis canonises two children at Portugal's Fatima shrine". BBC. BBC. 13 May 2017. Retrieved 13 May 2017. ^ a b c d e "Association of Towns awarded The Europe Prize". www.czestochowa.um.gov.pl. Retrieved 10 October 2009. 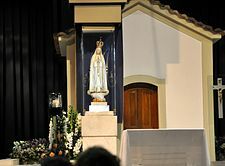 Wikimedia Commons has media related to Fátima. 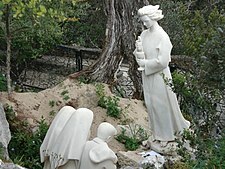 Wikivoyage has a travel guide for Fátima.